For years in the automotive industry, marketers have known that getting someone to actually purchase a car depends on much more than the features and latest gadgetry. No one buys a car solely for the face detection alert software – though certainly something like that can influence the decision. What really sells those cars, though, is a person's prior experience with a brand and the opinion of others that they trust when it comes to experiences with the car or brand. Word of mouth and prior experience, those are at the top of the list. Unfortunately, we don't often see automotive advertising and marketing focused on these two things. It's tough when each new campaign is for a different car, and time is limited to make the sale. With Honda's new campaign, however, they are squarely targeting consumers with perhaps their most formidable asset … their reputation. The new campaign has a tagline presumably inspired by overhearing consumers talk about Hondas: "everyone knows someone who loves a Honda." At the end of the ad, they direct you to a Facebook fan page instead of a campaign landing page and invite people to help "connect the world through Honda love." To date, over 133,000 people have accepted the challenge. Honda isn't the only automotive brand that could have done this. People love many different types of cars – the problem is that so often it is easy to focus on the car itself and not the affinity customers have with the underlying brand. 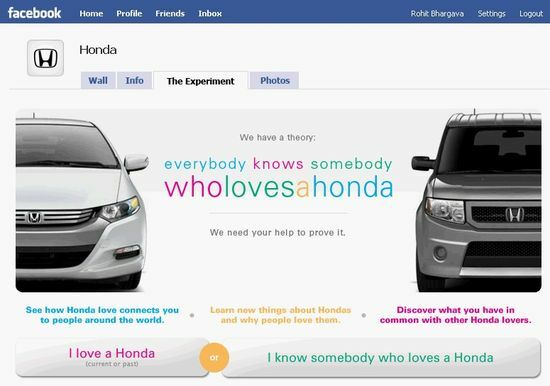 With this effort, Honda manages to remind us that by getting people to declare their love for a brand you are not only reminding them of what they love about your products, you'll also get them to raise their hands among their social network as an advocate who could influence their connections as well.